How did you become interested in textiles? I became very interested in textiles when I was doing my GCSEs. I was particularly taken by batik printing and embroidery. It’s ironic, but you could say that although I was born in Bangladesh, I am very much a product of British art education. People always think that I learnt about textiles abroad, but in fact my knowledge is very much from here. What attracted you to weaving in particular? 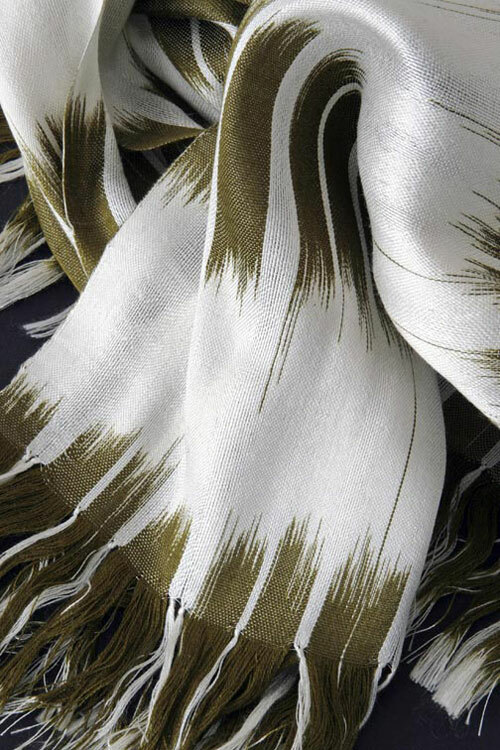 After my foundation course at Chelsea, I did a degree in textiles at Farnham. Originally I was planning to specialise in printing, but weaving swayed me. When I was printing I found I was making patterns using lines similar to those you get in woven fabrics – the decoration on the pieces were very minimal with hardly any patterns or florals and very much inspired by the ‘less is more’ aesthetic. And I found that I kept on wanting to introduce texture into the printed surface so I would try and build up layers of colour but, of course, that didn’t really work. It became obvious that weaving was what I should do. I wanted to do something that allowed me to make the most of the texture and feel of the cloth. And I also loved that amazing sense of creating something out of nothing rather than just decorating a surface someone else had created – it’s very challenging. Are you still influenced by ‘less is more’ aesthetic? Achieving a balance of colour and texture and light and air is what my work is all about. I love colour, but not for its own sake. Texture and colour have to be in harmony together. How do you design your pieces? It’s quite an organic process. I do lots of sketch book work first, but it’s not structural so there’s lots of room for freedom during the weaving process. 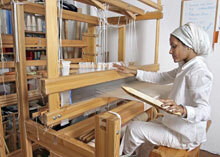 The weaving is a journey, but there is an inner sense of reason behind it. I agree with the philosophy of masters of craft such as Bernard Leach who believed that if the work happens in a certain way even when that way wasn’t originally intended, it’s meant to be – there’s something beyond your hands dictating where the work’s going. It’s quite a spiritual approach; my work isn’t religious, it just reflects the way I am in my life. How important is your Islamic background as an inspiration for your work? Originally I didn’t find my voice through my Islamic background. My voice is very British, but in the last five years I started to travel to countries like Spain, Turkey and Egypt, countries I was led to by my craft and the weather. In Turkey I found mosques that totally inspired me, especially the ones by the architect Mimar Sinan such as the Blue Mosque. I loved the way they are so architecturally harmonious, fitting into their environment perfectly. I was inspired by Sinan’s philosophy which was ultimately a result of his Islamic background. Although I was born into an Islamic family, prior to this trip religion hadn’t played much of a role in my work, but seeing work by other makers inspired by Islam made me change direction and start practicing my religion more consciously. The English countryside plays an important role in my work. I’m also influenced by the way Bangladeshi weavers use a type of inlay technique, adding hand embroidered motifs to the woven fabric as they work. 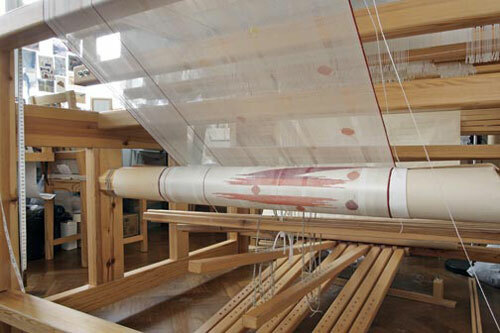 It’s a technique which gives you freedom to add motifs which you can’t do on the loom – weaving can be quite restrictive and the extra embroidery allows the work to flow and change a bit more. The motifs I use are normally naturalistic – I find inspiration in things like snow, sunset, mist – although sometimes I add geometric repeating patterns. Light is also very important in my work. I’m interested in transparency and translucency. I’ve always loved the amazing light you get about three hours before sunset and when I found out about Islamic philosophy I realised that it was divine light. Are your textiles intended to be functional objects? My work is very democratic. The pieces are flexible and I don’t want to dictate how they should be used – they can be wall hangings, room dividers, clothes... I tend to go with the flow when I work, so depending on my source of inspiration, I either make quite big pieces or smaller pieces and the size of the end piece effects the way people use them.